But while it's true that we don't get nearly as much snow as cities like Boston and Chicago, this attitude is still dangerous. Our auto accident lawyers have seen time and time again that winter driving is rife with dangers, even in Atlanta. It's especially dangerous if a driver isn't prepared and doesn't exercise the appropriate level of caution. You can do everything right, and still find yourself the victim of an accident because of another driver's lack of care. Williams & Williams Law Firm can help you pursue justice and compensation if you've suffered an injury as the result of such unfortunate negligence. First, let's get the obvious out of the way: yes, we do have winter in Georgia. And winter can still play havoc with the roads, even if Atlanta only averages about two snow days a year. Ice: While snow is relatively rare in Atlanta, ice storms are not. Every year, the Atlanta area is hit with multiple ice storms, and these play havoc with the roadways. While driving on snow isn't easy, driving on icy roads is even more difficult. Traffic: Atlanta drivers know that traffic is a problem here even in the best of weather. Our highways are always packed with commuters. Throw a sheen of ice onto those highways, and you have a recipe for accidents. Unfamiliarity: Because winters in Georgia are (relatively) mild, many drivers in the area just aren't as familiar with proper winter driving strategies. They don't know how to handle slick, icy roadways. Exacerbating the problem is the fact that local governments often have not invested much money in preparing for winter storms, meaning there aren't enough plows and there isn't enough rock salt when these storms do hit. And remember, even a relatively simple rain storm becomes something much different in the winter. If a thunderstorm soaks city streets in the afternoon, and the temperature drops below freezing at night, slick roads can become icy and treacherous without warning. Fortunately, you're not helpless in the face of winter storms. You can't eliminate your commute, but you can prepare for it and make it safer, even in winter. 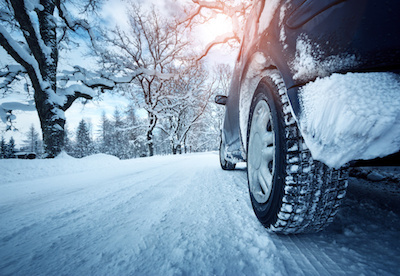 Tires, tires, tires: Many people invest in expensive cars with four-wheel drive in order to handle the winter, but nothing is more important than your tires. Before the weather really turns cold, have your tires looked at. You can decide for yourself if winter tires are a worthwhile investment, but whatever tires you do have on your car, make sure the tread is fully intact and your tires are properly inflated. If your tires aren't up to snuff, replace them. Prepare the rest of your car: Of course, your tires aren't the only important variables here. Check out the rest of your vehicle. Make sure your windshield wipers are still effective. Top off your wiper fluid. And check your fluid levels, including anti-freeze. Brush up on winter driving strategies: If you're generally unfamiliar with driving in the winter, don't panic. Driving in winter weather isn't always easy, but it's not rocket science either. Find information on winter driving strategies and commit them to memory. Do your research – arm yourself with knowledge. And pass down these pointers to your friends and family. Winter can be a dangerous time to drive, but for most people, driving isn't optional. A sound car and a calm mind will go a long way toward making your winter-time commute as safe as possible. If you've been hurt in an auto accident in the Atlanta, Georgia area, our lawyers can help. Please call Williams & Williams Law Firm today at 770-988-6898 for a free consultation.